It’s too cold to go out and snap many pictures today, so I thought I’d show a before and after of our old farmhouse. We aren’t sure exactly when it was built. One source says 1875. The carpenter that put the new basement under it for us thought it wasn’t quite that old, maybe around 1900. This farm was the first land claim made in Mitchell County in 1851. A log cabin sat somewhere on this site prior to this house being built. I love love love the new front porch. We didn’t get done in time to use it much this year but next year I’ll be out there in a porch swing, a book in one hand and a drink in the other, watching the kids play and the livestock graze, and waving at the neighbors as they drive by. Closeup of the porch. Before there were 2 porches, one over each door. 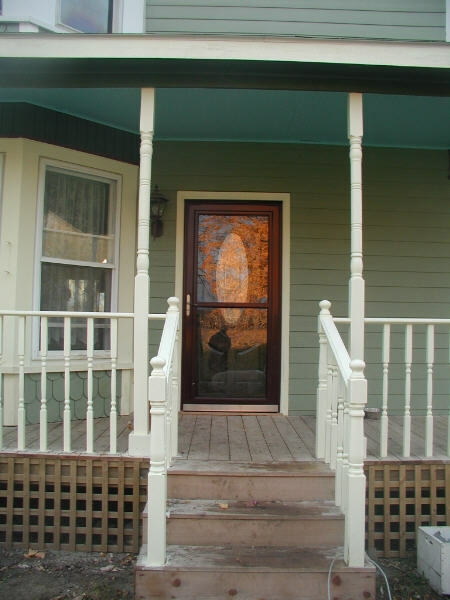 We extended the main porch so it wraps around the bay window to both doors. Matt painted the ceiling a turquoise-y robins egg blue. Our new front entrance. We’ve got a lot of painting to do next summer. The old front entrance looked like this. 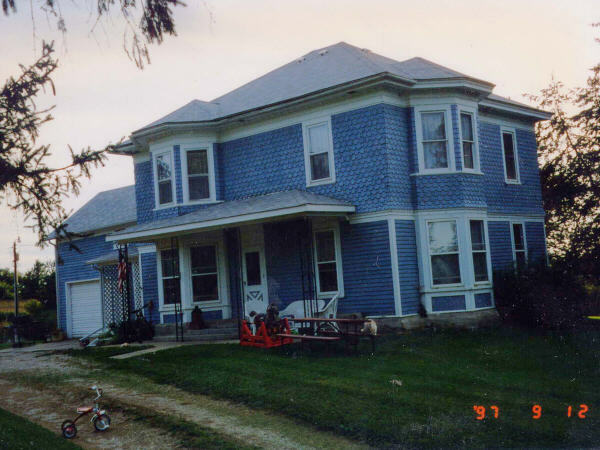 Good riddance to those wrought iron posts holding up your porch roof, but I did like the blue shingles. Looks like a wonderful place. Someday, maybe I can join you on the porch with a book and a drink too. What a beautiful house!Your home is lovely!Congratulations! Pablo – I liked the shingles, too. But shingles in fibercrete siding are 4 times the price of lapsiding in fibercrete. So we settled for shingles just on the bay windows (have to look close to see it). I think the porch turns it from a house into a home. I just love being able to sit outside. In the summer that is, tee,hee..
Oh what a beautiful home! 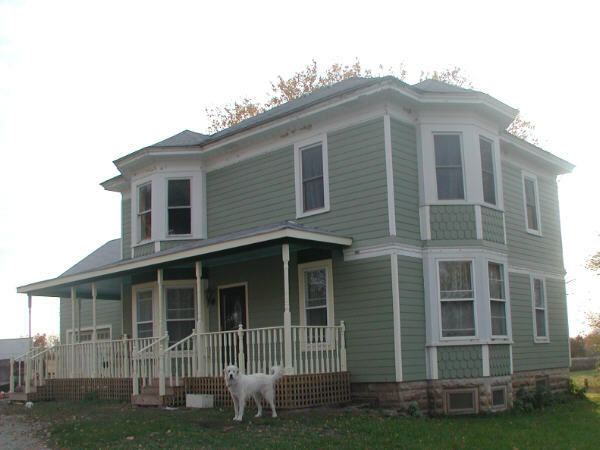 Having just undergone quite a bit of home rennovation myself this summer (new siding, new windows/doors, etc. ), I can empathize with the challenges of remodeling — but the results are so worth it! 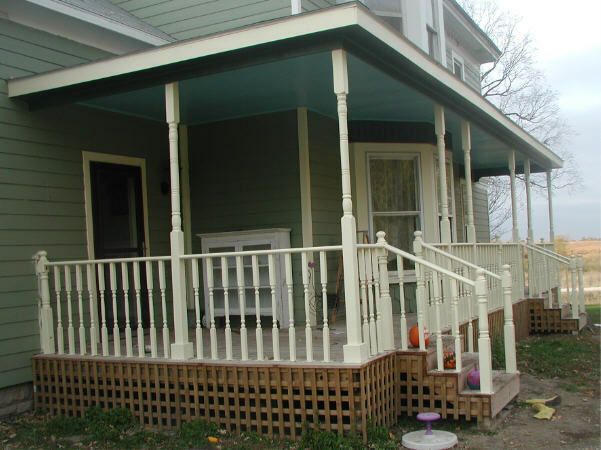 Love the siding color — love the porch — really a great home! Beautiful home! I love the new porch. I’ve always been a big fan of porches! Looks like a large home so you have lots of room! It’s gorgeous! Love the front door and I can’t wait to see your porch swing when you hang it next spring. Love your house! Beautiful and cozy! Wow! Nice transformation! Your house is beautiful!